The Brookings Interfaith Council (BIC) welcomes you to our new online home. We hope that it will become your home, too. We invite you to sign up to receive updates to this blog by email (see the box in the navigation bar at right). You'll stay up-to-date regarding upcoming events, community concerns, recommended resources, and more. To receive email reminders about BIC events, contact us. We hope that you'll join us for one of our discussions soon. If you're looking for a local faith community to explore, or for a resource person from a faith other than your own to engage in dialogue, consider emailing one of the representatives listed on our contact page. It is only when there is a deep understanding of one's own religious beliefs and commitments that progress can be made in achieving true understanding and respect for the religious values and beliefs of others. 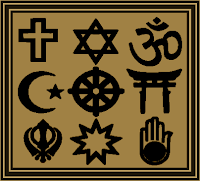 Engaging in interfaith dialogue does not in any way mean undermining one's own faith or religious tradition. Indeed, interfaith dialogue is constructive only when people become firmly grounded in their own religious traditions and through that process gain a willingness to listen and respect the beliefs of other religions.